I call Summer ice cube and ice cream season, and rightly so. With the uncommonly hot, hot Summer we're experiencing in the Carolinas, these two have become my household staples! So, when I was chosen to try out Blue Bunny's new ice cream products, you can say, I was more than delighted! I was ecstatic! And with good reason. Blue Bunny sure knows how to impress. They shipped the treats right at my doorstep inside this huge Styrofoam box filled with dry ice and the three ice cream products guaranteed to cool you off! Needless to say, the yummy treats didn't last long. It's all Blue Bunny's fault! I love the Champ! Mini Swirls Vanilla the best. Just the right touch of chocolate covering the vanilla-flavored ice cream inside. 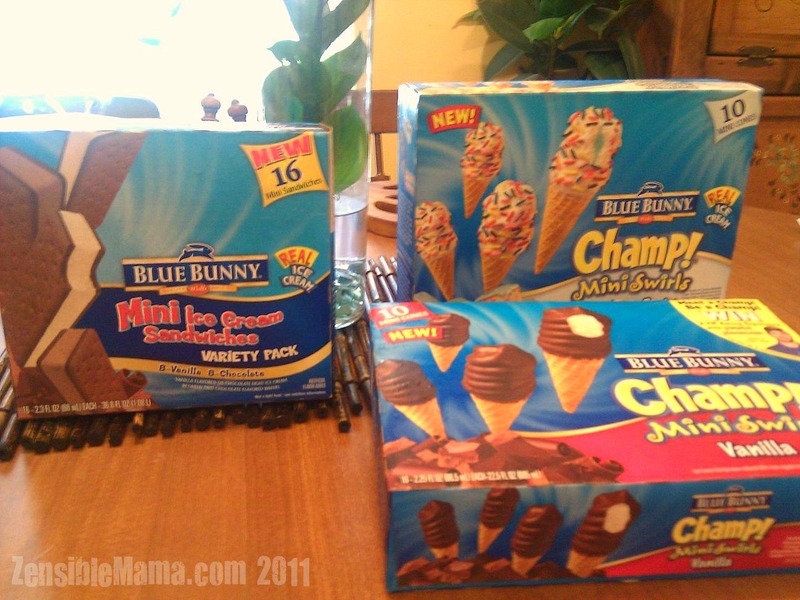 And of course, more crunchy chocolates at the bottom of the cone complete the yumminess. Champ! Mini Swirls Birthday Party - The amount of sprinkles covering the white chocolate covered ice cream was too much for my liking. Even my daughter was not pleased with it. We had to remove them before we can eat one. Though the blue frosting in the center added to the "party" theme of the product. Mini Ice Cream Sandwiches Variety Pack - I'm not a big fan of ice cream sandwiches but this was my hubby's favorite and he literally devoured it. Size - The mini sizes on all three was a great way to snack small. Great for kids too. Great portion control and great snack time option this Summer! Here's your chance to try this yummy treat! One lucky winner will win Bunny Bucks, a coupon for purchase of one Blue Bunny packaged ice cream or frozen novelty. Sweet deal! Here's how to win it! 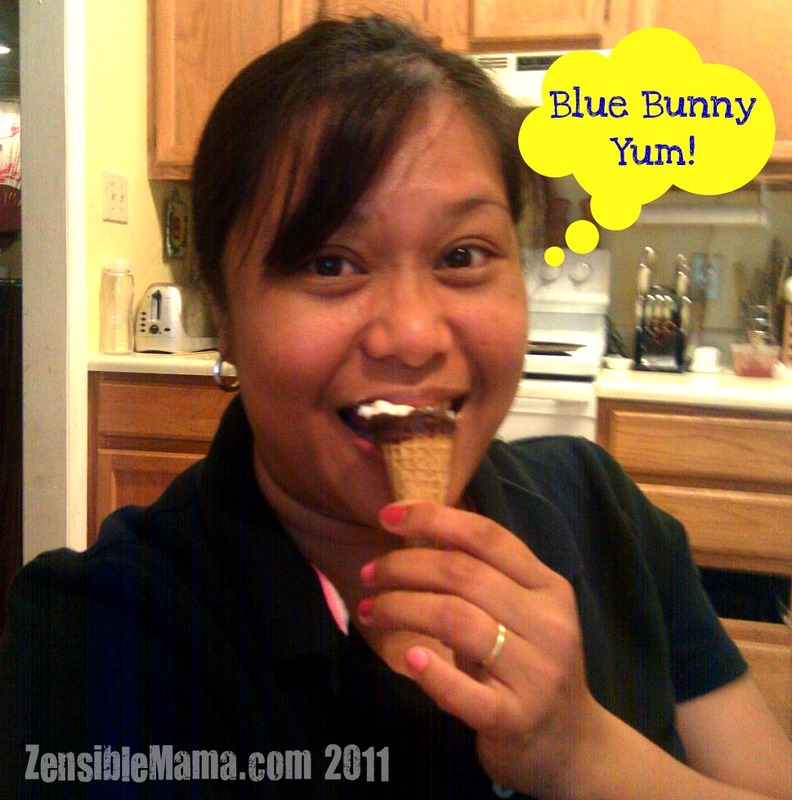 Simply follow Zensible Mama via GFC and tell us which Blue Bunny Ice cream product you like. Easy Peasy! Deadline: Wednesday, August 3, 2011 @ 12:00AM EST. You must leave your email address so I can notify you if you win. Winner will be announced no later than Sunday, August 7th. Random.org will be used to select winner. Open to US addresses only, 18 years and older. Winner will have 24 hours to response or another winner will be drawn. Sponsor will send the product to winner (Please allow 3-4 weeks for delivery). By entering this giveaway, you release ZensibleMama.com from any liability in case of lost, unreceived sponsored prizes. Blogging about your kids: Are you sure they're Ok with that? I am a gfc follower. I would like their orange dream pops. I'm an email subscriber and I accidentally posted before mentioning that I want to try the Champs! I'm a gfc follower. I like the ice cream sandwiches. I follow your blog with google friend connect and I'd love to try the mini ice cream sandwiches! We love ice cream sandwiches. I follow you on GFC(Linda G), my favorite is the mini swirl chocolate ice cream cones. I like the Vanilla Mini Swirls. Follow via GFC as Caryn S and like the mini ice cream sandwiches. I'm a GFC follower :) The ice cream sandwiches are the best! The small size sounds great. I follow on gfc and like the Premium Ice Cream Supreme Latte. I like the ice cream sandwiches! I follow you via GFC! I love their icecream sandwiches and fudge bars.